In addition to experiencing the joy of owning (at present) three dogs, three cats and a chinchilla, and fostering everything from dogs and cats to emus, Christina Owens has also volunteered with animal shelters and rescue groups and worked as an animal-control officer, where she’s seen firsthand the sad scenarios of missing pets whose owners can’t be found, and vice versa. 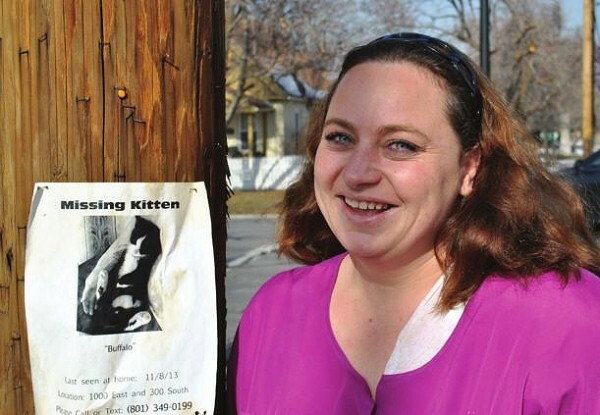 So, in March 2012, Owens started the Utah Lost & Found Pets Facebook page (Facebook.com/UtahLostAndFound). It’s since netted more than 4,000 likes, with around 10 posts per day from individuals who’ve found or lost pets. Owens also collects listing information from KSL, Craigslist and from the shelters themselves to facilitate daily reunions—the farthest-flung so far being an Oregon dog that made its way to Utah. For more information, visit the Facebook page or UtahLostAndFoundPets.com. Why did you start the lost & found pet page? I wanted to do something to help animals, but I didn’t want to go back to doing animal control. Part of being animal control was seeing that most of the dogs are brought in as strays; they’re not owner-surrendered. They belong to someone; it’s just connecting all the dots. I learned a lot of different places where [lost ads] were posted, and thought it’d be nice to have somewhere where as many as possible could be in one spot. I post from PetHarbor every day—that’s where a lot of the animal shelters post. But a lot of people have never even heard of it, so why would they look there? Everybody’s on Facebook every day—it’s one-stop shopping. I look at Craigslist, KSL, PetHarbor, throw them all together and match them up. How often are there success stories? Oh, it’s every day. We’ve had two already today. Do you match up the lost & found posts or do owners figure it out? What are some of the challenges of finding a missing pet? People don’t usually take the animal to the jurisdiction that it’s from—they take it to wherever is closest to where they’re going. Or they’ll hold it at their house. We had one who was driving home from Idaho, picked up a dog in Idaho and posted an ad in Spanish Fork. What should a person do if they find a lost pet? Take it to the shelter. People are really afraid to take animals to shelters, but it is the first place someone’s going to go to look for their pet. They don’t go straight to KSL or straight to Facebook—they immediately will call the shelter. It sounds scary to take them to the shelter, but shelters aren’t quick to euthanize. They work with rescue groups, they work with me, they get in touch with people to foster. Salt Lake County’s a no-kill shelter, West Valley’s on its way to being no-kill, others here are low-kill, so their percentages are above 80 percent—which is much better than the 36 percent just five years ago. There are still a few quirks to be worked out, and there are a couple shelters that we wish could at least go low-kill. But for the most part, you can take an animal in to a shelter and say, “I found this animal. Can I foster it?” and they’ll let you. And they’ll take its picture and scan for a chip while you’re there, and as long as it’s registered, they can find the owner really quick, or you can foster it. How can owners ensure their lost pets will be found safe? There’s a company that has GPS collars, which are really nice—as long as you keep their collars on, which doesn’t happen very often. There are locking collars so that your kids won’t take them off. There are tags, microchips—but a lot of people will get the microchip but not register it. The Humane Society will register the chip for you, but most vet offices won’t. All it takes is a phone call—it doesn’t cost any money. But it’s one of those steps that just kind of gets skipped. There’s not like a general database that they can go, “OK, this chip matches up with this lost dog.” So until something like that can come together, it’s up to the person to get it registered.